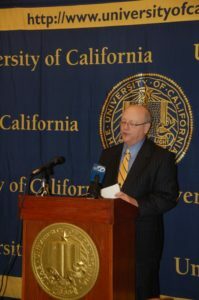 UC President Mark Yudof addresses student and state media organizations at the February 2009 Board of Regents meeting. 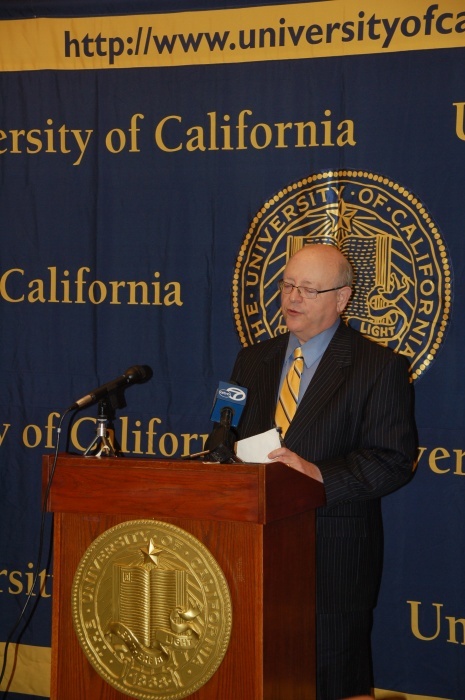 One year later, Yudof is still facing many of the same budget and diversity issues on UC campuses. Photo by Arianna Puopolo. We have to obey the state and federal rules on awarding financial aid, and if we award more than what they determine is your level of need, they subtract it out someplace else in the process. So we need to make sure students actually come out ahead in this process. … It’s absolutely almost a moral issue that if you’re below $70,000 we need to help you, but there are significant financial issues for families above that, who are not poor but not rich in the sense that they can just sit down, write a check and not think about it. Daily Cal [Berkeley]: Where do you think that student actions and your lobbying efforts meet? Are they complementary, or are they at odds? MY: They’re complementary. The peaceful demonstrations are helpful. … The governor had his constitutional amendment … reducing prison expenditures and increasing [funding for higher education]. … Now, I’m not endorsing anything like that per se, but what I am saying is he made clear what the problem is. We’re at great risk in this country because everybody has a recession, but in America it’s harming K-12 education, and it’s harming the community colleges. And our competitors abroad are not doing that. … Both developing and developed countries, even in hard times, they’re putting their money in their young people and that’s where it belongs. City on a Hill Press: What is your opinion on occupation as a tactic of protest? MY: I’m a First Amendment maven. I even wrote a book on it … in fact, over the years I’ve written about … rights of students to protest … but I’m not thrilled with taking over buildings and inconveniencing a lot of people, and on a few occasions destroying property in the buildings. That’s not protected speech. California Aggie [Davis]: There were … demonstrations yesterday at UC Irvine and UC San Diego motivated by some latent issues of race within the campuses. How will the UC make an effort to [address them]? MY: Well, there’ve been different incidents. We’ve had at least three of them that I can think of just in the last few days. … It’s a grave insult ­— well it’s really an insult to everyone, but particularly our African-American students and faculty. The [UCSD] chancellor, I think that she’s having teach-ins and discussions — there were various demands from the African-American students and I think we’re going to try to implement as many of those as we can. … I’ll just be honest with you: I really think there’s an issue, and we need to work to increase African-American enrollment down there, and African-American appointments to the faculty. I think everyone joins me in condemning these particular incidents. … This is an enormous problem, and I wish I had a simple answer. We’re working with campuses — the people on the ground have to do it. I issued statements and all that, but the real action has to be on the campuses. California Aggie: Does this mean that you’ll be looking at any kind of affirmative action policy? MY: My position on affirmative action has been clear for at least 25 years, maybe longer. I’m pro-affirmative action. Proposition 209 was a mistake. I’m in favor of giving financial aid to undocumented students. But we have a state law … the new admissions system pushes very hard for comprehensive review — that means your life is not summed up just by your SAT and your GPA. We’re hopeful that that will be helpful. We’re hopeful that more community college transfers [will apply]. … We have to obey the state law even if we don’t like it, and we could be called to task for not doing that, so I feel like I have one arm tied behind my back with these issues.